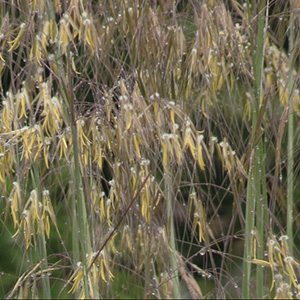 Stipa gigantea is known as the giant feather reed grass, it is tall growing and when in flower makes a real statement in the garden. Although it is tall, to around 2.2 metres in height, it is slow growing and will take a few years to hit its stride in terms of flowering. It is well worth the wait, as the flowers are very long lasting and add height to the garden. We think it is best planted towards the rear of the border, as the lower foliage is a little scrappy, however well worth a place for the flowers. Propagation is from seeds, it is not a plant that takes well to being divided or moved. This is an ornamental grass that can be used as a specimen plant. You could plant en mass, however we do like it as a stand alone clump. Very useful in the perennial border and it could also be grown in containers, we do prefer it in the ground. The flowers tend to arch outwards, which gives it a graceful look, so give it room to show it off to its full potential. As long as the soils well drained, and the position is reasonably sunny, this is a very easy care grass. It can be pruned back to around 15cm to 20cm above the ground in late autumn to early winter. Do not go to low with the pruning as this can cause growth problems. These are a plant that do not like to be moved. Generally just mulch around the plant, a little general purpose fertiliser will be beneficial. Position – Full sun to a little shade.. Soil – Well drained normal potting soil. Spread – Will spread to form a clump over time, in flower to around 1.5 metres. Flowers – Silvery blue turning to yellow. Flowering Time – Mainly in spring, however very long lasting.